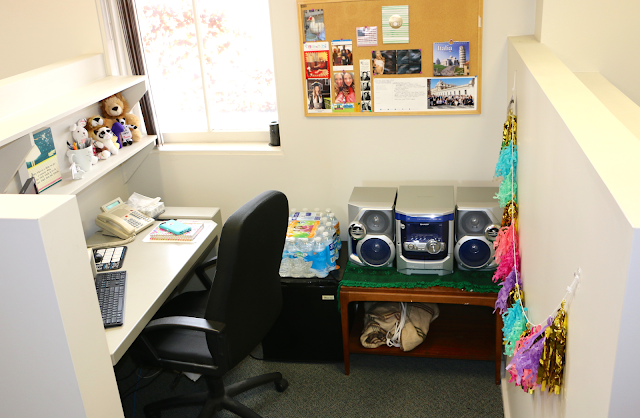 Welcome to my new home away from home- my office cubicle! Well- technically speaking the place that I spend the most time at my new job of course is the radio studio, but I do other things at my job other than just talking live on the radio. 😉 When I'm not doing my shows live in the studios, I can be found in this cozy and colorful cubicle, working on a variety of different tasks. Most of the on-air personalities have their own offices downstairs near the radio studios, but since I'm the newbie in the building I was given a cubicle upstairs in the sales department. I actually really like being up there for my office space- the sales staff at our stations are so nice and it is fun to get to work around them as well and not just the programming staff. ALSO: sometimes various members of the sales team bring their dogs into work in the afternoons- so guess who gets to hang with puppy visitors when she gets off-air?! When I moved into this cubicle during my first week of work, I was so excited to have a space at work that was all mine to decorate and personalize! And my cubicle is also a space where I can store snacks to eat between talk breaks on-air, and a good supply of Nestlé® Pure Life® water bottles to keep me hydrated all day long! 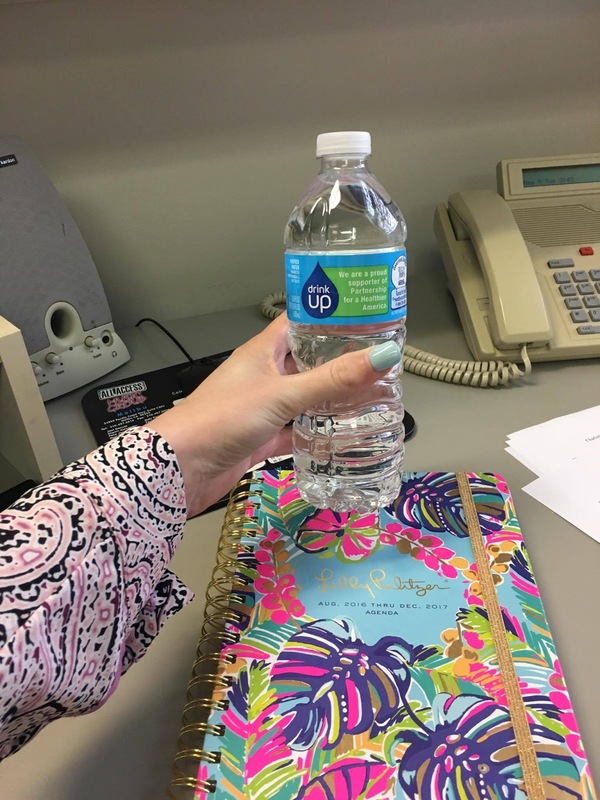 Since a good majority of my job involves talking (and at loud and upbeat volumes), it's extra important that I stay hydrated during work, so I always make sure to keep Nestle Pure Life bottles on hand. Starting the tour off on a bit of a sentimental note... this is my childhood CD collection! When I was a little girl and obsessed with Top 40 hits of the day and dreaming about someday being a radio host, these CDs were some of my most prized possessions. Even though I still listen to early 2000s music on the daily, I do most of it through streaming thanks to my Spotify Premium membership, so these were all just sitting around in my childhood bedroom in Maine for years. My mom brought them for me to keep in my new apartment, but I thought they would make a fun cubicle decoration given my line of work, and I love the sentimental value! 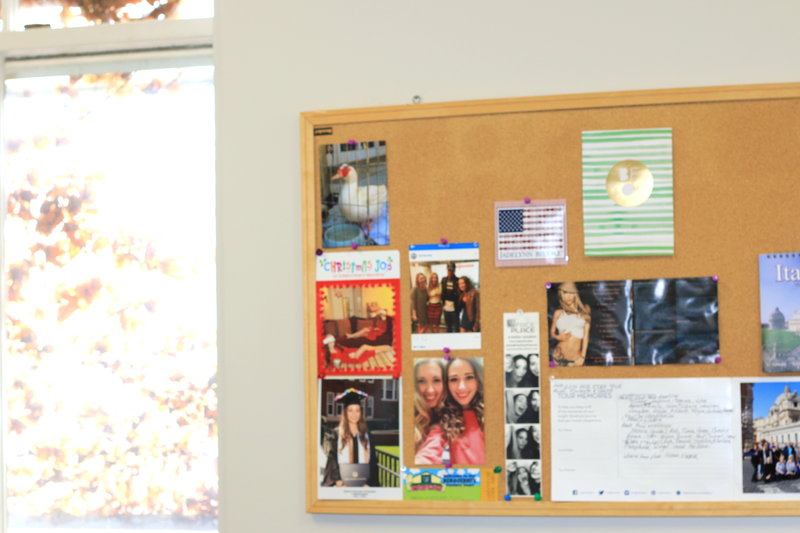 My main tip for decorating your cubicle at your first job is to use leftover dorm and college apartment decorations! I had a ton of things from my four years of living on campus that I had used as room decor- items that I didn't want or need in my first solo apartment, but at the same time they were also things that I wasn't quite ready to part with. So my cubicle came to the rescue! This makeup mirror was one of them, and it served a great purpose. 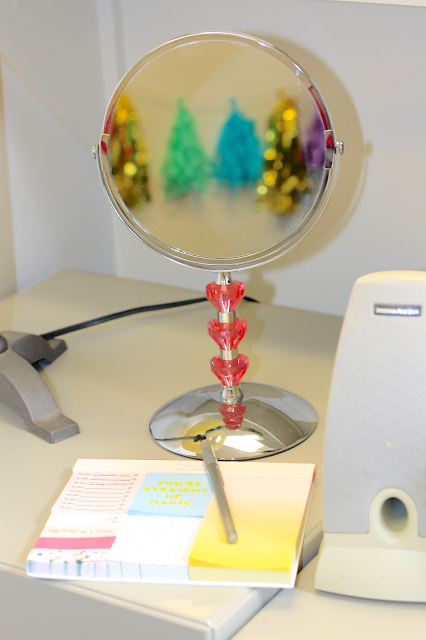 I wanted a mirror at my desk so that I could touch up my lipstick throughout the day, and with my makeup situation in my new bathroom (there is a big wall mirror) I had no use for this little mirror from college anymore. So to work it went! And this notepad was a Christmas gift from Cara- it's so helpful and I use it to jot down my various work tasks of the day. I used a similar notepad to it when I interned at my broadcasting school for the past six months. You can also catch a glimpse in the mirror of my favorite tassel garland, which I use to decorate the back wall of my cubicle! That was formally in the dining room of my old apartment in Charlotte. One of the things that was left in my cubicle by the "previous tenant" was this bulletin board! As you can see, I haven't completely decorated it yet as I've only been at work for a few weeks, but I've already added some photos of favorite Charlotte memories with my best friends there, and a few other fun decorations. I'm excited to see it become completely come together as the months go by! I think that a bulletin board is an awesome idea for a cubicle space- what a fun way to make a space more personal. This shelf is above my computer. My fellow cubicle-mates, the sales staff, clutter their shelves with paperwork and other work things, but since most of my job is contained to my voice and my computer (and one neatly organized binder), I didn't have any work related things to put up there. So more college decorations came to the rescue! You might recognize the little art print on the left from various dorm room tours that I've shared on the blog in years past. I purchased it a few years ago at the store that I used to work summers at in Maine, and I still think the quote on it holds very true! 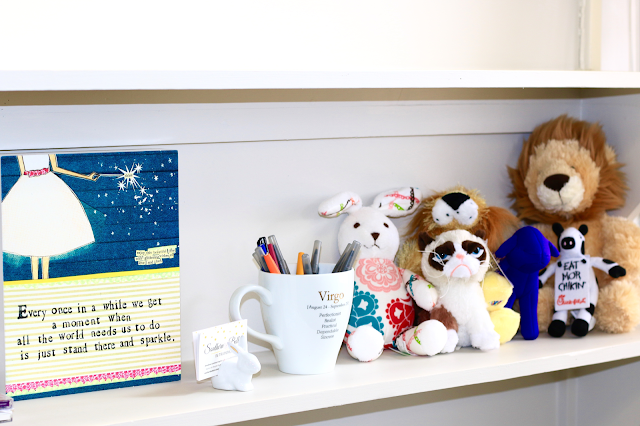 And then my own special touch to my cubicle- my college stuffed animal collection. I amassed all of these through various ways throughout college- the lions were gifts from sisters in ADPi (our sorority mascot is Alphie the Lion), the Chick Fil A cow was a fun restaurant freebie, and the others were gotten through various means. The stuffed animals were another thing that I didn't think really belonged as decoration in my first solo apartment, but I didn't really want to part with them either. So I think they add a really cute touch to my cubicle! And lastly, pens and markers in a cute mug, and blog business cards in my favorite rabbit business card holder. 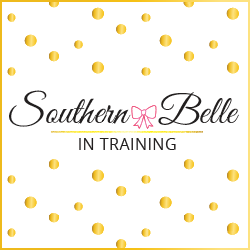 You never know when someone wants a Southern Belle in Training business card! The full desk area! My work provided me with the lamp that's there, and behind it I also have a couple of personal framed photos that I can see when I'm sitting at the computer. There's a small end table that was also provided for me by my work that sits under the bulletin board. 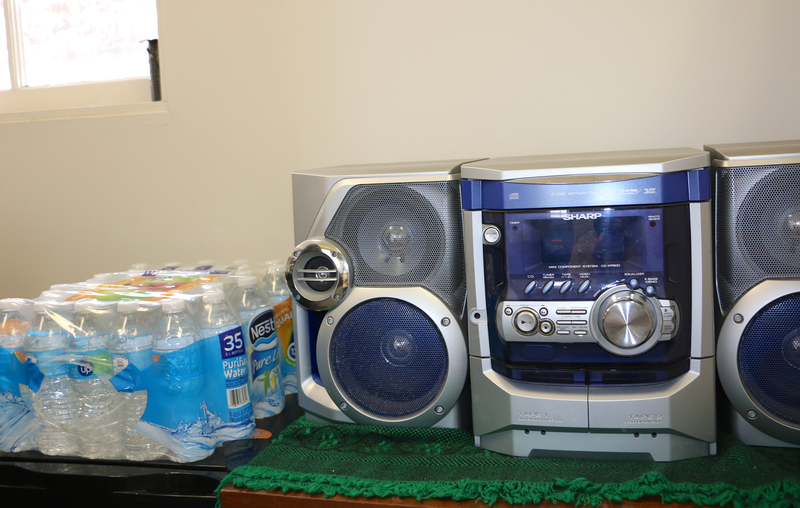 My work also left me with this (MASSIVE) boom box... complete with a double cassette deck and multi-CD player! It is the most early 2000s thing that I've ever seen... and I immediately fell in love with it, haha! It also plays the radio, but instead of listening to my stations, I like to listen to a local country channel when I'm at my cubicle. 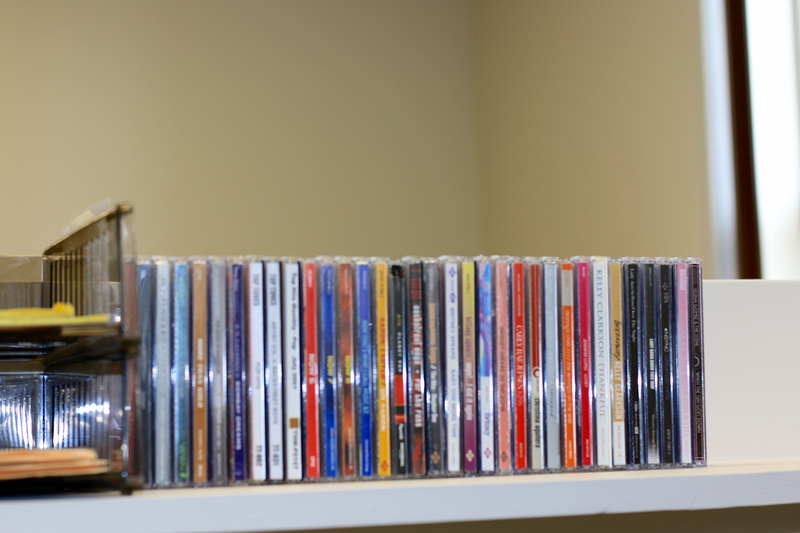 I love working in Top 40 and Adult Contemporary radio, but when I'm at my desk it's my time of day to clear my head from the music that I work in! Next to the boom box might just be the most important thing in the cubicle (yes- even more so than my computer!). I can't stress enough how important it is for me to stay hydrated as a radio personality, so that my voice is always sounding its best and that my throat doesn't dry out! Nestle Pure Life water bottles continually come to my rescue in this department. I've been buying Nestle Pure Life water bottles for years now. The tap water at my university tasted very funky, so I always bought water bottles in college when I lived on campus, and Nestle Pure Life bottles were my favorite to buy since they tasted great and were affordable! 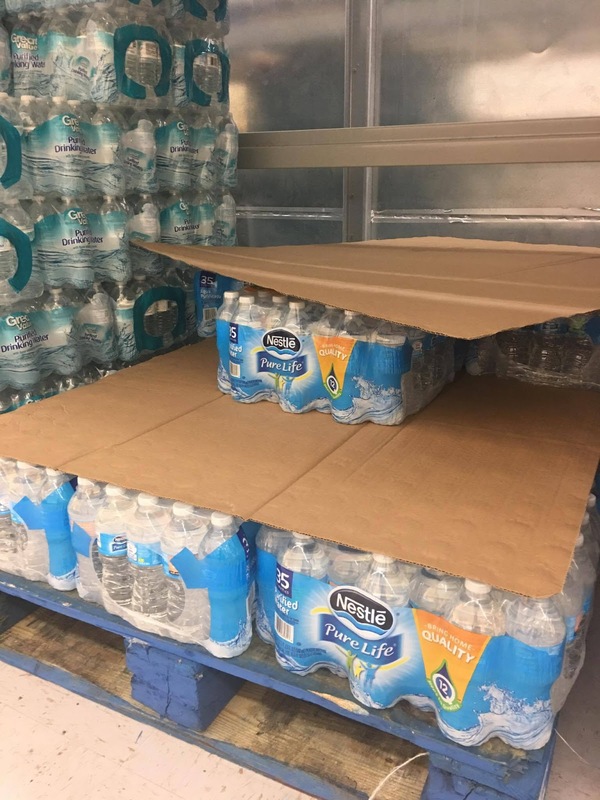 And even better news: now at Walmart stores you can buy this 35 pack of Nestle Pure Life bottles for the same price as a 32 pack... so it's like getting three water bottles for free! What a great deal. (At Walmart.com you can find 24 packs of Nestle Pure life bottles... this amazing 35 pack deal is only in Walmart store locations!) 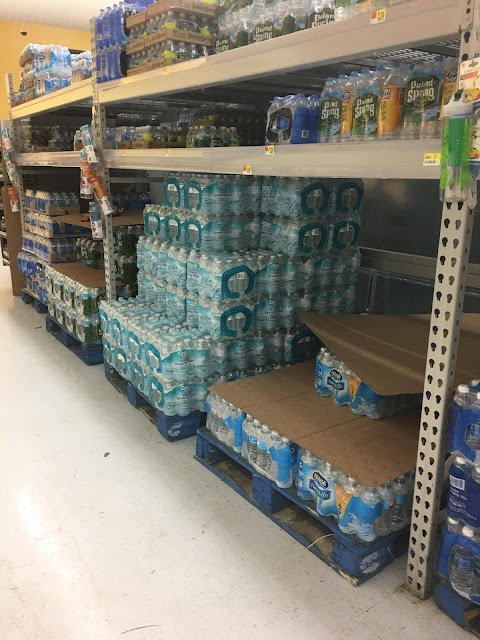 If this version of Nestle Pure Life is not available in your local Walmart, you can ask a store manager about getting the product in your area. Also be on the lookout starting in mid-May for new packaging from Nestle Pure Life! Did you also enjoy decorating your cubicle? (And if you're still a high school/college student, did you enjoy decorating your workspace area in your room?) And is water also a workday staple for you like it is for me? Thanks so much for reading! Have a great Monday. I love that you still have a boombox and actual CDs!!! I wish I knew where all my CDs from high school went! 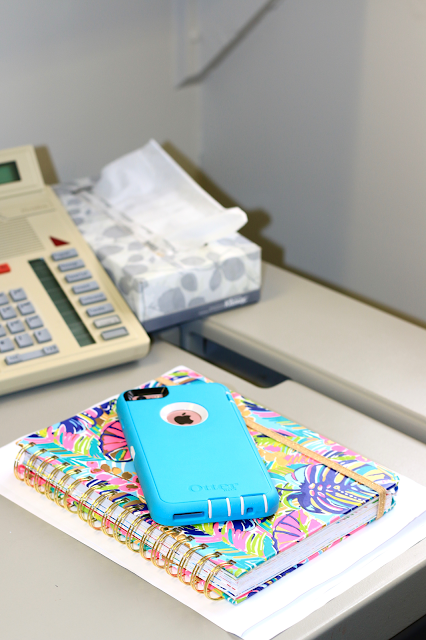 Your cubicle is just so cute! I love how personalized it is! Having water around at all times is definitely super important! 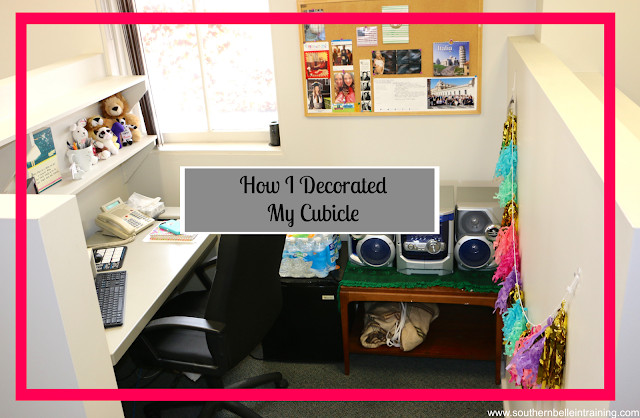 I used to love decorating my office space! I work from home now so that would obviously be a bit of a moot point, but I loved the company art I hung around my office walls as well as the personal touches I added. Definitely makes being at work a bit brighter! I liked your office space, very cute. Love the tassel decoration! I need to decorate my home office so I'm actually more inspired to work there. I love the tassel banner you have hanging up! Love the tassel banner! Such a fun touch to brighten the office! Love the tassels! Your decorations definitely brighten up the space! I miss having a cube, I love how you decorated an otherwise drab thing to work in! Love the tassels so much! 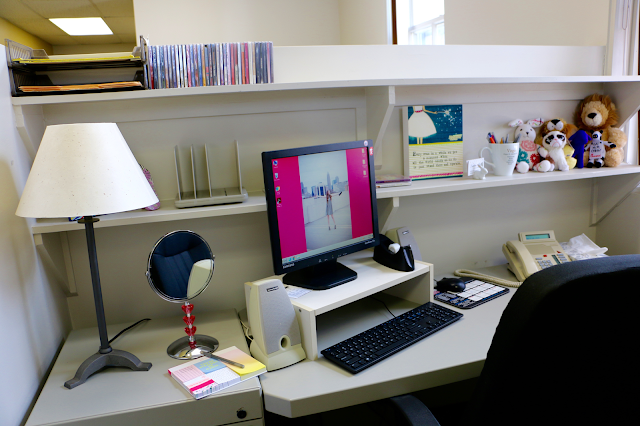 I love how you personalized your work space, it looks so cozy! Your cubicle is so cute! It definitely shows off your personality! What a cute little space! I love the old school boombox - haha! If you've done your home work, it's time to decide which jobs you can tackle Best Reverse Osmosis System yourself and which ones you need to leave to the professionals.